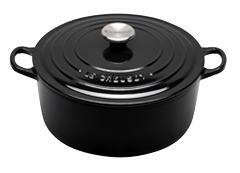 Because it's made of cast iron, which retains heat superbly and cooks evenly, this pot is ideal for preparing savory stews or braising meats and vegetables. These hearty dishes nourish the body and nurture the soul. With braising, food is first seared quickly at high temperatures. Then it’s simmered slowly in liquid along with onions, herbs and other seasonings, filling the kitchen with enticing aromas. The nonreactive enamel coating requires no seasoning. With the lid in place, foods retain moisture, so meats emerge fork tender and vegetables, silky smooth. Dishwasher safe. Made in France.